The global business landscape is littered with expensive, well-intended strategies that failed in the execution phase. Some of these doomed strategies make the front pages and the evening news. Many more die quietly or simply disappear into desk drawers and forgotten PowerPoint presentations. But all represent a significant drain on resources that could have been used more profitably elsewhere.What explains these failures of strategic execution? In many cases, executives lack a systematic approach for identifying and implementing the right array of actions needed to deliver on their promised strategies. Worse, they make broad – and mistaken – assumptions about how well the strategy they have in mind converts into understandable work at all levels of the organization. They also overestimate their company’s ability to effect the changes necessary to implement their latest strategic vision. Even when executives do break their plans into clearly defined and doable chunks of work, they don’t necessarily collaborate with leaders of strategic initiatives to prioritize and stage the necessary investments. Many also neglect to revise their company’s portfolio of strategic initiatives to fit the demands of a dynamic business environment. Others lose touch with these initiatives when the outcomes (new products, services, skills, and capabilities) are transferred to operations. No longer in tune with the practical ramifications of their strategy, they’re unable to determine whether the implemented strategy is delivering as promised. 1. Ideation – how to clarify and communicate the company’s identity (its inherent value), purpose (its reason for being in business), and long-range intention (what it will create in five, ten, twenty, or more years into the future). 2. Vision – tactics for translating the identity, purpose, and long-range intention into clear goals and metrics that enable leaders to determine whether goals have been achieved. 3. Nature – a framework for aligning the organization’s strategy, culture (the values it cherishes and the kinds of people, activities, and achievements it celebrates), and structure (including decision authority, reporting relationships, information flows, and performance evaluation and incentive systems). 4. Engagement – a process for managing the company’s portfolio of strategic initiatives dynamically, so that the right mix of projects is continuously redefined to execute its strategy in the face of rapidly evolving markets and technologies; and so that strategic projects receive continuous reviews for ongoing relevance, and adequate resources (time, money, skills, equipment, and attention) to succeed. 5. Synthesis – methods for monitoring and aligning project work to ensure that all scarce resources – especially scarce human resources — are being dynamically deployed to maximize strategic benefits. 6. Transition – how to move the results of strategic projects into the mainstream of the company’s operations, so the organization can rapidly reap the projects’ benefits. These six imperatives provide a crucial roadmap for any organization—not just for-profit corporations – seeking to successfully carry out its strategies. The imperatives guide individual efforts as well.The authors mine a rich array of examples (successes as well as stumbles) that range from AT&T and American Power Conversion to Airbus, from Wipro and Yahoo! to Lance Armstrong’s Tour de France teams. 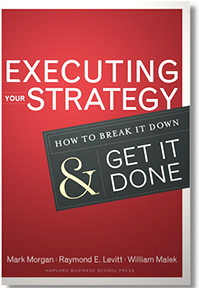 Filled with practical advice, compelling real-world examples, and hands-on diagnostic tools at the conclusion of each chapter, this new resource enables leaders in any organization to make strategy happen. Mark Morgan is CEO of StratEx Advisors and was Chief Learning Officer at IPSolutions Inc. Mark also served as Practice Director of the Stanford Advanced Project Management Program. Raymond E. Levitt is a Professor in Stanford University’s Engineering School, Director of Stanford’s Collaboratory for Research on Global Projects, and Academic Director of the Stanford Advanced Project Management Program. William Malek is an independent consultant, trainer, and former CEO of IPSolutions, Inc., and was the Stanford APM Program Director from 2002 to 2006.